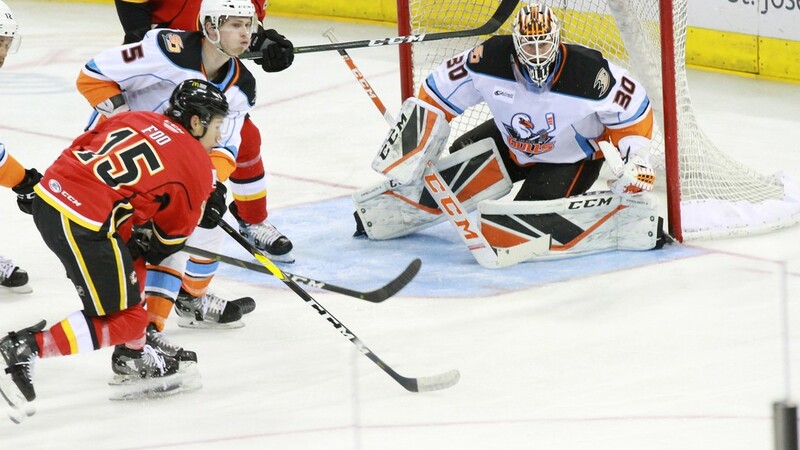 Jeff Glass stopped 20 shots and Sam Steel scored twice as the San Diego Gulls avoided two losses in two nights in Stockton with a 3-0 victory over the Heat on Saturday evening. Steel opened the scoring 17 minutes, 31 seconds into the first period when he put a wrist shot from the right faceoff circle past the blocker of Heat goaltender Jon Gillies for his 16th goal of the season. Adam Cracknell scored 15 seconds later on a shot from in front of the net off a pass from Corey Tropp from behind the net for his 10th goal in 19 games with the Gulls since being acquired by their NHL parent team, the Anaheim Ducks, Dec. 10, from the Toronto Maple Leafs in exchange for defenseman Steven Oleksy. Steel scored an empty-net goal with five seconds left. The shutout was the Gulls first since March 16, 2018, when Reto Berra stopped all 37 shots in a 2-0 victory over Milwaukee. The shutout was Glass sixth in his 208 regular-season games in the American Hockey League. “That was one of the best games I’ve ever been a part of as a goalie,” Glass said after his record improved to 101-7-0-2 and 8-3-0-1 with the Gulls since being acquired Dec. 10 from the AHL’s Toronto Marlies in exchange for future considerations. The shutout was the 33-year-old Glass’ first since Feb. 15, 2017, when he made 37 saves for the Rockford IceHogs in a 2-0 victory over the Cleveland Monsters. He also had 16 shutouts in his seven seasons in Russia’s Kontinental Hockey League and two in his lone season in the ECHL. The Gulls led 36-20 in shots, including an 18-5 edge during the scoreless second period. The Gulls killed all four power-play opportunities for Stockton (23-26- 4-1), the Calgary Flames’ AHL affiliate. The Gulls (30-17-3-3) were scoreless on their two power-play opportunities. Gillies (11-15-4-0) made 33 saves before a crowd at Stockton Arena announced at 6,436. The Gulls and Heat will meet again Wednesday at Pechanga Arena San Diego.